You should run the program now to setup the account names and types you will be importing. You can get help on this window and any of the other windows in ImportQIF by pressing F1. When you run ImportQIF and no account names are setup, ImportQIF will default to the Setup tab. 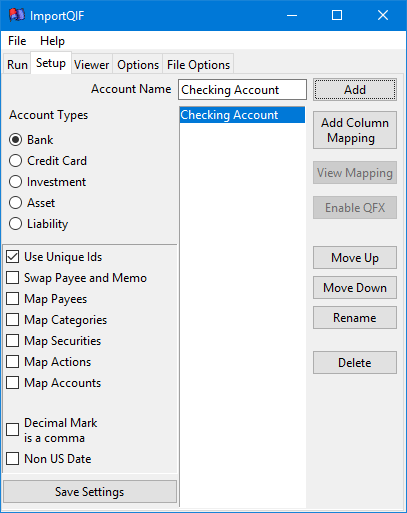 The Setup Tab is where you enter the account name and type, and if needed tell ImportQIF how to map CSV/Excel columns to Quicken©/QIF fields. 1. Type in the account name exactly how it is in Quicken. 2. Pick the account type. 3. Select any options at the lower left if they are needed (see option descriptions below). 4. Select Add to add this account name/type which will appear in the Setup tab list, and as a button on the Run tab. 5. If you going to use a CSV or Excel file, then you will need to select Add Column Mapping (For details on non investment account column mapping select here. And for investment account column mapping select here). New Features: Use Unique Ids, Swap Payee and Memo, and Map Accounts. ImportQIF can now use unique ids to block duplicate transactions from being imported. User can now decide to swap the payee and memo on an account by account basis. In the case of OFX, QFX, or Excel & CSV files using the account column there can be multiple accounts in one data file. This feature can be used to map the names in the data file to what they are in Quicken. Note that in the case of OFX and QFX these are the account ids, and are most likely not what you want for your account names in Quicken. You can use the Map Categories option/file to look up payees and add the category to the transactions. This is a substitute for Quicken’s use of the Memorized Payee List to do automatic categorization. Check out the details below and on the Options tab documentation. Below shows what it looks like after you have added an account. Use Unique Ids option tells ImportQIF to use unique Ids to block importing the same transaction twice. You can control how long the unique ids are kept on the Options tab. Swap Payee and Memo option tells ImportQIF to swap the payee and memo in all the input data file formats except Excel and CSV. These two data file formats require the user to state what column of data to use, so you can already swap them when doing the column mapping. Note that the Swap Payee and Memo for all accounts option on the Option page will override what is selected on this option if it is set to Yes. 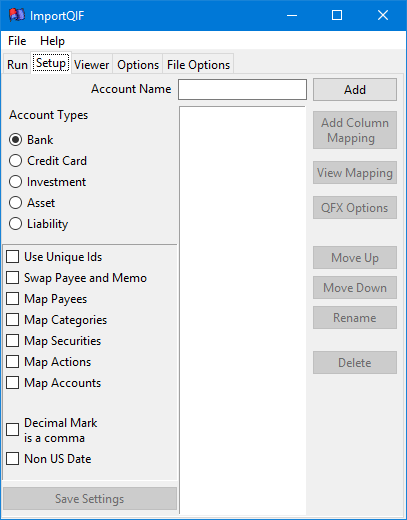 If you select the Map Payees option, ImportQIF will ask for you to setup a mapping from what the payee name is called in the data file to what you want it to be called in Quicken/converted QIF file. The reason for this option is because Quicken doesn’t apply its renaming rules to QIF imports. Note that you will have four options, Contains, Starts_With, Exactly, and Reg_Exp (regular expression). Most people will use Contains or Starts_With. Regular expressions are powerful, but hard to get right. The file that these mappings are saved in can be changed on the Options tab. If you select the Map Categories option and the transaction doesn’t already have a category, ImportQIF will ask for you to setup a mapping from the payee name (after the payee mapping is done, if requested) to what category you want in the transaction. Note that you will have four options, Contains, Starts_With, Exactly, and Reg_Exp (regular expression). Most people will use Exactly, this will perform in the same way Quicken’s automatic categorization from the Memorized Payee List works. Regular expressions are powerful, but hard to get right. The file that these mappings are saved in can be changed on the Options tab. Also, there is a Merge button you can select to merge the payees/categories from Quicken’s Memorized Payee List. It is suggested you use it before you try to use this feature for the first time, so that you have a starting list of payees to categories. 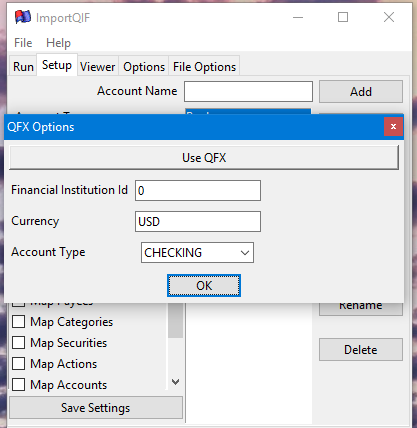 If you select the Map Securities option, ImportQIF will ask for you to setup a mapping from what the security name is called in the data file to what you want it to be called in Quicken/converted QIF file. The file that these mappings are saved in can be changed on the Options tab. If you select the Map Actions option, ImportQIF will ask for you to setup a mapping from what the action name is called in the data file to what you want it to be called in Quicken/converted QIF file. The reason for this option is because some financial institutions put garbage that keeps changing, in the action field. Like Div paid on 2/1/2016. Note that you will have four options, Contains, Starts_With, Exactly, and Reg_Exp (regular expression). Most people will use Contains or Starts_With. Regular expressions are powerful, but hard to get right. The file that these mappings are saved in can be changed on the Options tab. 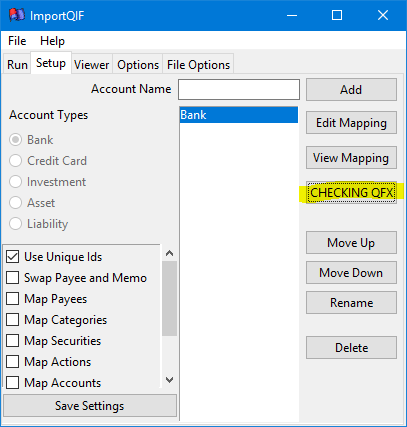 If you select the Map Accounts option, ImportQIF will ask for you to setup a mapping from what the account id/name is called in the data file to what you want it to be called in Quicken/converted QIF file. The file that these mappings are saved in can be changed on the Options tab. NOTE that when one of these “Map” options are active, ImportQIF will prompt while reading the data file for any payee/security/action/account it doesn’t find in this CSV file, and allow the user to add it at that time. So, it is not necessary put in all payee/category/security/action/account names to start with. But the user is free to edit the CSV files directly (Entering your Quicken renaming rules is a good start for the payee mapping option. Unfortunately, there is no way for ImportQIF to read the renaming rules like it can do for the Memorized Payee List.). Comma Decimal Mark option will translate amounts from this format 100.000,00 to 100000.00, which is what the US and Canadian versions of Quicken needs in their QIF files. Quicken US/Canada QIF import will only accept dates in the MM/DD/YYYY format, so for dates in the DD/MM/YYYY format you will not be able to import them in the Quicken US/Canada without translation. The non US date is expected to be in DD/MM/YYYY or YYYY/MM/DD. The format is fairly flexible. All of the following would work: 31/1/2010, 31-01-10, 31.1.2010, 21/01/90, 1999-1-31. Note if you use YYYY/MM/DD format the year has to be 4 digits. Determining what options are selected for a given account. If you select an account name in the list, it will show you which options have been set. Note that if there is no column mapping data, you there will be an Add Column Mapping button. Once column mapping data has been added to the account it will change to an Edit Mapping button. You can change the account type and/or the options of an account, by selecting the account in the list, changing the options and then select Save Settings, to save these. For CSV/Excel files the user needs to tell ImportQIF what the columns in the data file map to in Quicken/QIF file. 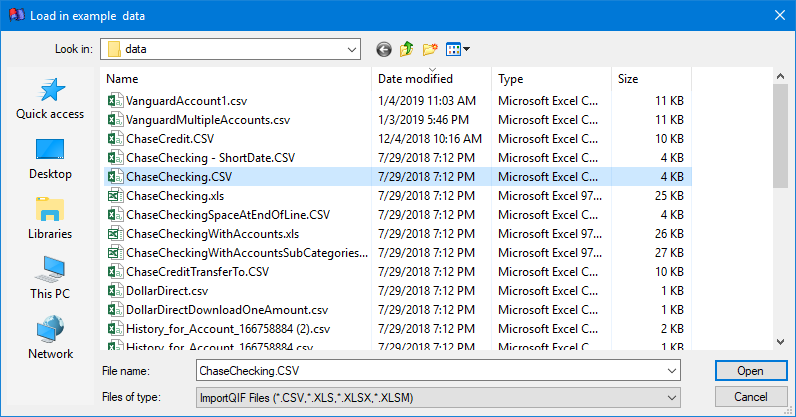 ImportQIF will bring up a dialog for you to browse for an example CSV/Excel file. 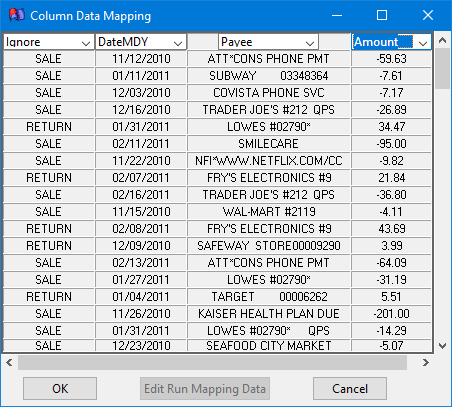 After opening the example data file, ImportQIF will bring up the Column Data Mapping window. The idea here is to tell ImportQIF which columns to use for what purpose. After your created a column mapping (if needed) you can use the Edit Mapping and View Map buttons to change/view the column mapping. The Edit Mapping button will bring up the same Column Data Mapping dialog shown above. The View Map column mapping is shown below. Select the Enable QIF button to setup using a QFX output file instead of a QIF file for importing into Quicken. Note that your version of Quicken must be supported by Quicken Inc for this to work. Also, at this time ImportQIF will only convert Excel/CSV files to QFX format. The first time you select this you will get the following explanation. You need to fill in the financial institution Id. 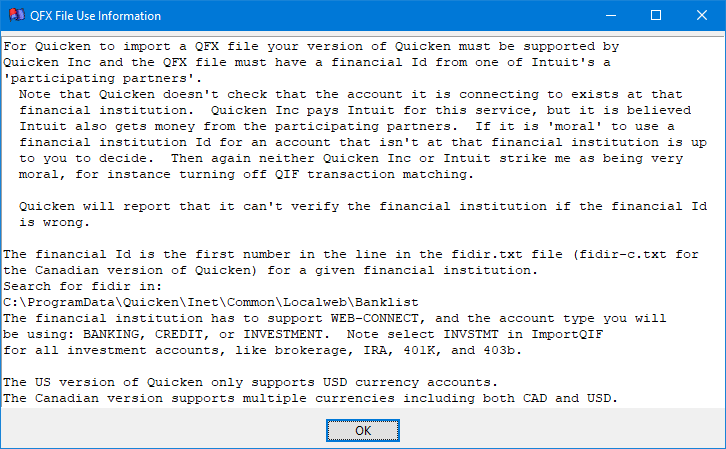 Note that the QFX format has account types for Checking and Savings, whereas the QIF format just uses Bank. Select the Use QFX button to enable outputting a QFX file instead of a QIF file. Note that the QFX format doesn’t allow for categories or for split transactions. Categories must be added by Quicken, and you need to either pre-enter split transactions and match them to the imported ones, or manually split them after importing. Shown below with QFX mode enabled. The next step is to check/set the general options here is the instructions on the Options Tab.